Back on March 15th, I wrote how mom’s KitKat habit switched to a Starlight Mint habit. (The latter is still in full force.) The comments were wonderful, but I had a special back-and-forth with The Master of Something I’ve Yet to Discover, who tried to educate me about TimTams and the war between Crunchies and Violet Crumbles. 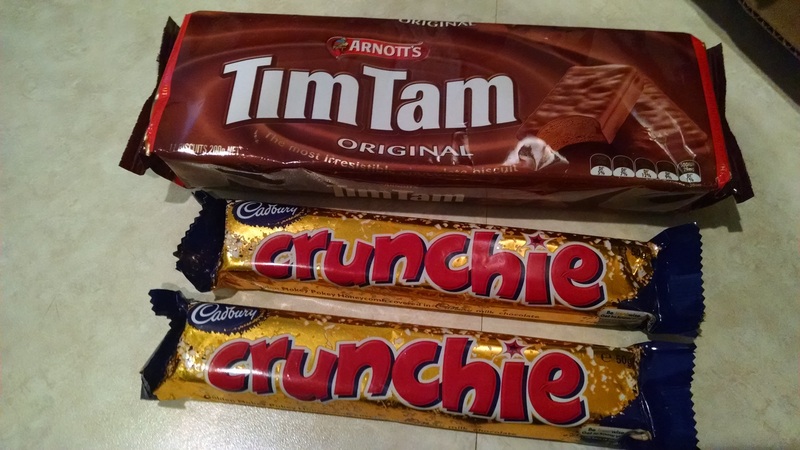 I got the distinct impression that this is the Australian “Hatfields vs. McCoy” war of candy bars. I relayed to The Master how difficult it is to pick sides without ever having eaten any of the aforementioned. I suggested an overnight Fed-Ex delivery. Fast forward a few weeks and a Scot wearing a glengarry in New York City went to the UPS store and sent a package to a cheesy sort. Golden Hokey Pokey Honeycomb covered in Cadbury milk chocolate. I’m not sure how a song and participation dance from the 1940’s and 1950’s relates to a candy bar. Is it required that I stick my right foot in and shake it all about while taking a bite? The Crunchie reminded me of a cross between a Butterfinger bar and Angel Food candy, a confection that is prevalent around Christmas. It was also extremely sweet. Have you picked up on my affliction for dark chocolate in prior posts? And that I went on a two-week sugar purge to reduce my cravings? I bet you did. 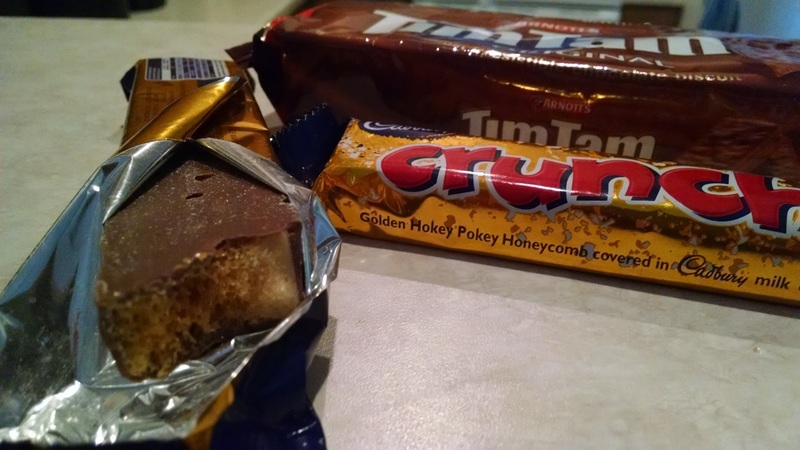 Anyhow, they might be the reasons why I found the Crunchie bar to be too sweet. As the honeycomb crumbled all over the counter, the sugar blast hit me hard. As a 10 year old, I would have LOVED Crunchies. That was a time when I ate sugar dots off pieces of wax paper and drank flavored sugar water out of wax bottles. (Lots of wax here, but that has no bearing on anything). On Friday, the Captain Crunch taste buds of long ago were sending the Crunchie taste buds down the gang plank. I know, The Master has to be saddened, as well as the rest of the Crunchie-loving world. Or you’ve all fainted in disbelief. Get up and keep reading. 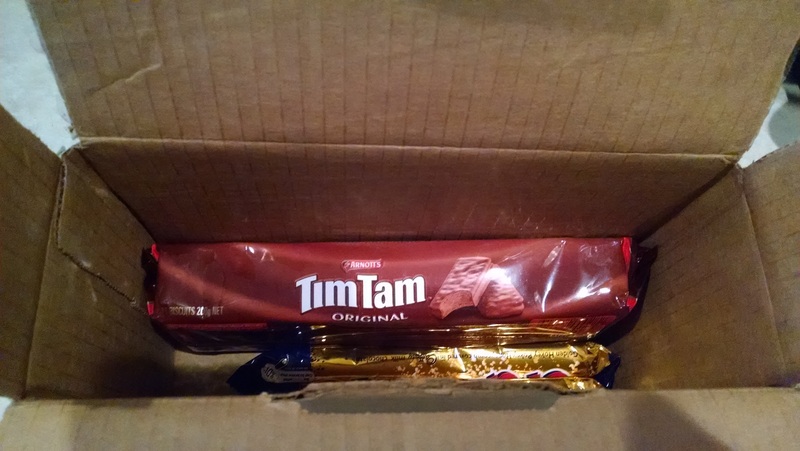 To make matters worse, the TimTams didn’t fare much better. A little less sweet, I found them to be just “okay”. As much as I wanted to revel in confectionery heaven, I couldn’t get excited about the little chocolate biscuit. Not good – I will never be an honorary Australian. So, my next conundrum was passing on this information to The Master. Dare I be honest? Or do I reply with an, “Oh Master, you are so wonderful for sending me that most delicious and yummy and wonderful chocolate. It was to die for and I’ve eaten every last morsel. I love you forever!” What you, dear readers, may or may not know is that I am honest to a fault. No, I will not tell you that you are wearing the most hideous red shirt ever (that would be mean), but I will tell you to go in the bathroom and pick out the green that is stuck between your two front teeth. In this instance, I had to tell The Master the truth. Whew, dodged a bullet. A blogging friend from across the pond remains a blogging friend. The Master is too sweet. She deserves an award of some kind (I think I still have a slightly used rubber band and shiny paper clip from my desk drawer at work). Unfortunately, the Crunchies bar was not touched during my visit and I have no knowledge of what the aides thought of this candy. Perhaps next Saturday I will get a full report. I imagine, though, that the TimTams were history by the end of the day and all that is left are some teeny tiny chocolate morsels left in a crumpled package. To put an end to this post, I have to say this is one of the reasons I find blogging so enjoyable – connecting with sweet people like The Master. And having intelligent Star Trek conversations with bloggers like Dan. Snarking with another Aussie, M-R. Meeting author Andra Watkins in person (her books will rock your world). Always admiring Herman’s photos of Mr. Bowie. Enjoying the escapades and cookies of a Canadian named Joanne. There are many, many more, all of whom I enjoy bonding with in some way or another. Thank you again Master H, for the special package. The Crunchie bar and TimTams might have been too sweet for me, but your good deed has not gone unnoticed or for naught. The postie* will reward you soon. *Postie is a mailman in Australia – unlike a pastie, which is a meat pie of Michigan’s upper peninsula or a round, battered pie from Northern Ireland or something to cover part of a woman’s anatomy. Further explanations can be found at Wikipedia. Why thank you, Andrew! Glad I could be of service! Thanks for the shout out Mary. I guess chocolate is in the eye of the beholder too. You’re welcome, Dan. I have become a bit of a chocolate snob over the years. My motto used to be “Dove or above”. Now, it’s the award-winning, homemade dark chocolate of Wilmar’s or above. I can’t compete. I’m happily glomming down Reese’s Peanut Butter Eggs. I’ll eat just about any chocolate. Absolutely H, most pleasurable! And there is nothing better than a shiny anything to distract us from what we’re really supposed to be doing. She’s a little ripper, is MOSY, M-J. She has a heart as big as a barn, and an over-developed activity ethic. She also has a real brain. Sighh … It’s the reading, you see: I’m so bad at it. MOSY is the BEST! That was so cool of her to surprise you like that! My favorite chocolate bar is Endangered Species dark. You might find that repulsive, but I adore it as much as you adore your Crunchie. You are welcome…anything for a mountain climber with key lime tarts ! I have had the same reaction to Toblerone. I love the concept: milk chocolate with bits of toffee shaped like a row of traffic hazard cones. What’s not to love? Although the chocolate is a really good quality, I can’t stand the effect of the sticky bits of toffee gumming up the works and making me pick at my teeth with spastic desperation. I never got into Toblerone. The teeth picking doesn’t sound like much fun. I have become a chocolate snob over the years, sticking up my nose at milk chocolate because of the dairy and sicky sweetness. Give me a quality hunk of 72% dark chocolate and I’m in heaven! *Endangered Species Panther (88% dark chocolate) – Because you are a woman on the wild side. *Ghirardelli Intense Dark Twilight Delight – Because you wouldn’t cuddle up to a vampire–you’d stake him through the heart before batting eyelashes at him. *Lindt Chocolate Swiss Luxury – but without the chart that tells you what each candy is, because you are a woman of mystery a nobody can define you in terms of a cream filling or nutty nougat. Now tell me, how close did I get? 1) Endangered Species 72% 2) Wilmar’s (local) dark truffles 3) Dove dark. I use Ghirardelli dark chocolate in my cookies. All things considered you made great guesses! You have exceptional tastes. I will now have to hunt out Wilmar’s chocolates. I hope it isn’t so ‘local’ that we don’t have it where I live. Yes they do. I’m in trouble. Serious trouble now. Previous post Rejoice in the Mount!